Created by a former firefighter in 2006, today Station 43 Tavern is Solon’s resident “hot” spot. Conveniently located on Aurora Road in Solon, Station 43 is a firehouse-themed restaurant that caters to Northeast Ohio residents and families looking for quality, crave-worthy fare. From American to Italian, from Polish to seafood, the Station 43 menu has it all. Ditch the chains and try one of Station 43’s signature sandwiches for lunch. All Station 43 sandwiches are piled high with your choice of meat or veggie fillings. 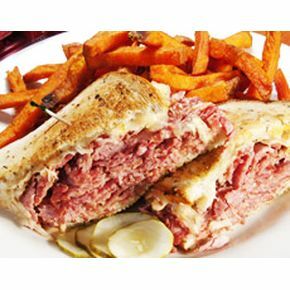 We’re talking high-quality sandwiches like a Reuben that was voted “The Best in Solon.” Plus, the efficient and friendly staff makes dining in a breeze—even on your busiest of days. Throwing a party? Let Station 43 Tavern do the heavy lifting for you by hiring them to host or cater your next event. Station 43 has a 45-person dining area, a bar, and even a semi-private party room. Let the culinary team make your next event a special one. Sun.-Thurs. 11 a.m. – 10 p.m.
Fri. & Sat. 11 a.m. – 11 p.m.